The manual is useful for extension workers and recommended for tropical and sub-tropical settings (photo by ILRI/Asaah Ndambi; cover page by WUR and FAO). A new manual on manure management aimed at helping extension workers to more effectively disseminate knowledge to livestock farmers is now available. The Manure management manual in the (sub-)tropics: Training manual for extension workers publication is co-authored by Asaah Ndambi and David Pelster, scientists from the Livestock Systems and Environment (LSE) program of the International Livestock Research Institute (ILRI), along with two other scientists from the Wageningen University and Research Centre (WUR) and the Food and Agriculture Organization of the United Nations (FAO). It was co-published by WUR and FAO in October 2015. 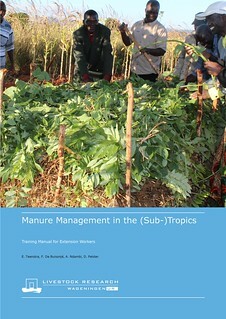 The manual is recommended for manure management in tropical and sub-tropical settings in sub-Saharan Africa, Central and South America, and South and East Asia. Focusing on integrated manure management, the manual explains the optimal handling of manure from collection to treatment, storage and application (as organic fertilizer for crops and feeds for aquaculture). But it cautions that the recommended integrated manure management approach is site specific and its effectiveness is influenced by local settings and circumstances. For instance, manure management procedures and guidelines relevant for farms of smallholders are different from those suitable for large-scale, industrial farms. The manual is intended as a handbook for extension workers and not as a scientific report, and it gives a detailed explanation of the key concepts of manure management. Manure is a source of crop nutrients, organic matter and renewable energy. Recycling of nutrients and organic matter contributes to healthier soils, making manure important for soil productivity. Manure can be a good substitute for synthetic fertilizer, which is expensive particularly for smallholder farmers, and is a key resource for improving their livelihoods and food security. According to the manual, the livestock housing system in use determines the type and characteristics of manure produced. For example, for free-range and kraal housing where urine is ‘lost’ and not collected, the manure type is dry dung, while zero-grazing with daily flushing produces liquid manure, and zero-grazing with scraping gives slurry manure. The presence or absence of a roof, concrete flooring and any form of enclosure also determines the type of manure. The manual lists various manure storage and treatment processes and procedures. Anaerobic digestion, or the oxygen-free biochemical process for decomposing organic matter with the use of anaerobic microorganisms, is discussed considerably. Anaerobic digestion is useful in production of biogas for cooking and electricity and reduces workload, as well as greenhouse gas emissions. The manual was compiled by the Livestock Manure Management Component (LMMC) of the Agriculture Initiative and funded by the Climate and Clean Air Coalition of WUR. Download the manure management manual. See a related article on a global study on improving manure management policies and practices. Tags: Asaah Ndambi, David Pelster, FAO, ILRI, manual, manure management, SLS, smallholders, WUR. Bookmark the permalink.